A new flavor of ransomware, similar in its mode of attack to the notorious banking software Dridex, is causing havoc with some users. Victims are usually sent via email a Microsoft Word document purporting to be an invoice that requires a macro, or a small application that does some function. Macros are disabled by default by Microsoft due to the security dangers. Users who encounter a macro see a warning if a document contains one. If macros are enabled, the document will run the macro and download Locky to a computer, wrote Palo Alto Networks in a blog post on Tuesday. The same technique is used by Dridex, a banking trojan that steals online account credentials. It's suspected that the group that distributes Locky is affiliated to one of those behind Dridex "due to similar styles of distribution, overlapping file names, and an absence of campaigns from this particularly aggressive affiliate coinciding with the initial emergence of Locky," Palo Alto wrote. Ransomware has proven to be an enormous problem. The malware encrypts files on a computer and sometimes on an entire network, with attackers demanding a payment to gain the decryption key. Files are unrecoverable unless the affected organization has regularly backed up and that data hasn't been touched by ransomware, either. Earlier this month, the computer system of Hollywood Presbyterian Medical Center was shut down after a ransomware infection, according to an NBC news report. The attackers are asking for 9,000 bitcoins, worth US$3.6 million, perhaps one of the largest ransom figures to be made public. There are indications that Locky's operators may have staged a large attack. Palo Alto Networks said it detected 400,000 sessions that used the same kind of macro downloader, called Bartallex, that deposits Locky onto a system. More than half of the systems targeted were in the U.S., with other affected countries including Canada and Australia. As opposed to other ransomware, Locky uses its command-and-control infrastructure to conduct a key exchange in memory before files are encrypted. That could be a potential weak point. "This is interesting, as most ransomware generates a random encryption key locally on the victim host and then transmits an encrypted copy to attacker infrastructure," Palo Alto wrote. "This also presents an actionable strategy for mitigating this generation of Locky by disrupting associated" command-and-control networks. 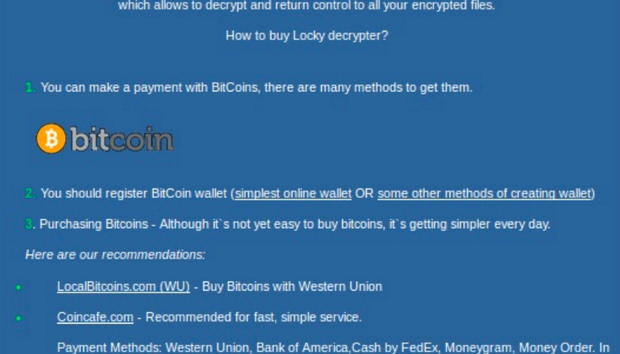 Files that have been encrypted with the ransomware have a ".locky" extension, according to Kevin Beaumont, who writes about security issues on Medium. He included guidance for figuring out who in an organization has been infected. The victim's Active Directory account should be locked immediately and network access shut down, he wrote. "You will likely have to rebuild their PC from scratch," Beaumont wrote.